Everyone needs a savior. The world can be a pretty sad place, even a bit dangerous. Darkness creeps over us, slowly, sometimes without us even knowing what is happening, even while we hide in seeming comfort amidst a calming low fire in the fireplace. Deep down, we know that something traumatic may await us at any moment, but what is there to do? How can we possibly find any degree of peace in such a world? Well, we don’t need to be quite that dramatic. All that darkness and fog is mostly just the buildup of soot in our chimneys thanks to all of that warm fire! There’s not a whole lot that we can do ourselves… at least not without turning into a sooty mess… but it is important to get those things cleaned out as soon as possible. We wouldn’t want any magical visitors to get themselves clogged and stuck in the chimney, would we? Thankfully, we have a few allies who can tend to those problems and do it all with a delightful song in their heart. 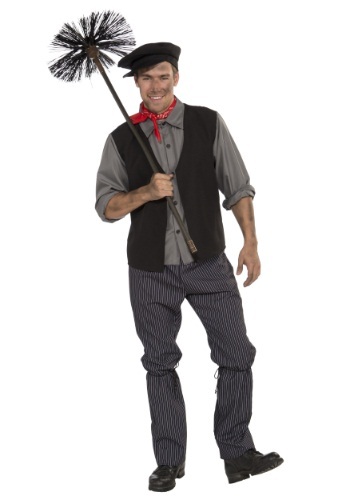 Join the ranks of the world’s most optimistic (and artistic) dancing and singing blue collar workers with this Plus Size Chimney Sweep costume. The shirt and vest combo is made of comfortable polyester poplin fabric and has buttons at the cuff and center front for easy wear. (Be sure to roll those sleeves up as it gets pretty hot over a fireplace!) The bright red bandanna scarf is a crucial component. Well, technically it doesn’t help your job at all, but it does give some lovely contrast and is a perfect marker for the ‘20s! The black poplin cap has a stiffened bill, likely from all that soot. Now, we cannot promise that your singing and dancing skills will find themselves suddenly soaring up into the air, but you might find some serious boosts if you happen to team up with a magical nanny (who might also be a Time Lord).